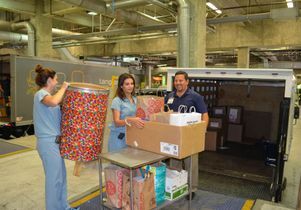 Jess Samson and Saba Riazati, both cardiac perfusionists from the Ronald Reagan UCLA Medical Center Operating Rooms, help load a truck from the Los Angeles County Department of Social Services Tuesday with boxes, bags and barrels filled with school supplies donated by the main operating room staff. Hundreds of scissors, notebooks, erasers, boxes of crayons and other school supplies are on its way to children from low-income families, thanks to operating-room staff at the Reagan UCLA Medical Center. For the past three weeks, nurses, perfusionists, technicians and support staff have been collecting school supplies for children with the assistance of the Los Angeles County Department of Social Services. The county program serves more than 3,500 kids monthly across the greater Los Angeles area. On Tuesday, organizers of the drive delivered a bounty of donated supplies. “Most people get into the giving spirit around the holidays, so to see this level of community outreach mid-year is not only inspiring, but just another testament to the UCLA family’s commitment to their community,” said Saba Riazati, a cardiac perfusionist and one of the organizers of the drive at the hospital.